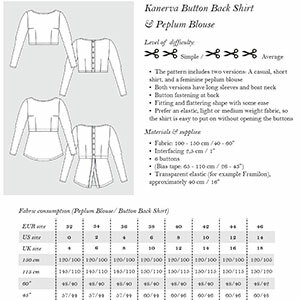 The Kanerva Button Back Shirt pattern includes two versions: A casual, boat neck shirt with long sleeves, and a feminine peplum blouse. Both versions have long sleeves and button fastenings in the back. It is a fitting and flattering shape with the perfect amount of ease. This is a simple to average level sewing pattern. Suggested fabrics are light to medium weight fabrics with or without stretch. Try any of our specialty wovens or a light to mid weight knit such as cotton jersey, cotton lycra, jersey rayon or ponte de roma.